The Houston television station that temporarily stopped broadcasting Sunday is back on air. Employees at KHOU-TV, the city's CBS affiliate, were forced to evacuate to higher ground after rising water from the Buffalo Bayou submerged much of its office and studios. When the station also briefly lost its broadcasting signal, reporters streamed on Facebook. The station received technical assistance from WFAA-TV, its sister station in Dallas, a control room at CBS News in New York and Houston Public Media. KHOU is using a makeshift studio provided by the public media organization. "We are back!," the station's assistant news director tweeted Sunday afternoon. The station's coverage of Harvey captured the attention of viewers from around the world. 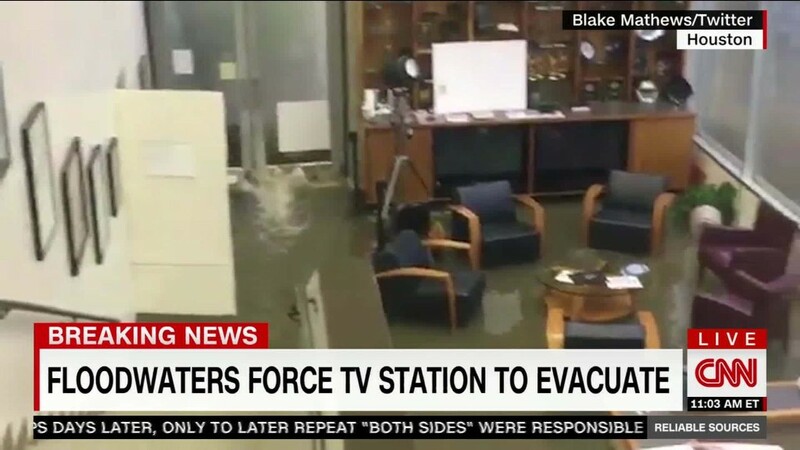 As they evacuated Sunday, reporters and editors tweeted photos and videos of flooding inside the station's lobby. "My last look at the KHOU Channel 11 lobby before it was flooded by Harvey," tweeted the station's managing editor, Bill Bishop. In the video, water is shown streaming in through closed doors and swallowing the legs of chair and tables. "Water has risen a foot in 15 min," tweeted KHOU weatherman Blake Mathews. "I'm one of the last in the building. God help us." At one point, Bishop said that crews used the Houston branch of the Federal Reserve Bank as a "temporary home." It appeared overnight that at least some staffers were using the makeshift Houston Public Media space for sleeping quarters. Morning anchor Russ Lewis tweeted a photo of a blow-up mattress just after midnight. "Good night from an edit bay" at Houston Public media, he said. "See you back on air #khou11 in a few hours." As the crews evacuated Sunday, KHOU reporter Brandi Smith anchored coverage from outside on the street. Her actions also attracted worldwide attention. At one point, Smith spotted a truck driver trapped in rising water and flagged down rescue crews to help him. The segment was viewed 1.2 million times on Facebook. --CNNMoney's Jill Disis contributed to this story.